It's been a while since I last reviewed something but this is a good one to do! Trivia/Sidenote: I associate this book with Sunway Pyramid - my lovely friend was kind enough to show me around there during my last day in KL, Malaysia :) and it was at Popular bookstore that I bought Practical Mandarin Guidebook (for non-native speakers). Authors: Associate Professor Cheun Heng Huat; Low Hiang Loon and Kuek Chee Wee. I'm not sure if this can be ordered online as it is a Malaysian publication. This is an incredibly useful and practical book suitable for advanced beginners such as myself (I wouldn't dare to upgrade myself to intermediate level just yet lol). 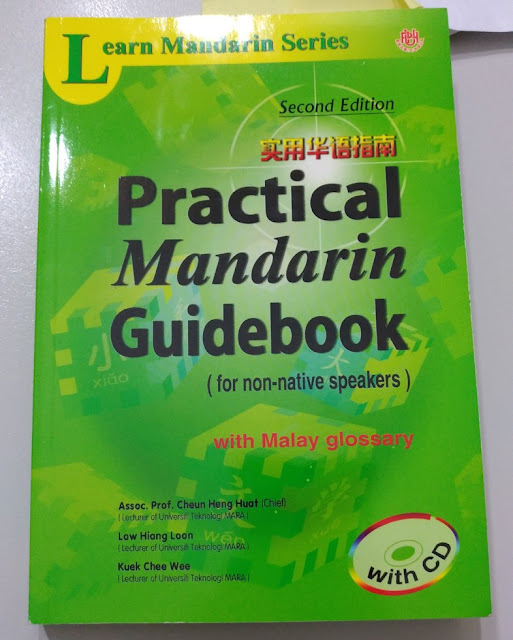 That means that, to get the most out of this book, you need to know pin yin, the four tones and (probably - although maybe not necessarily) some basic sentence structures. The book itself is 90% vocabulary (sorted into 44 everyday and miscellaneous topics) and 10% sentence patterns - which is an interesting concept. Each of the 44 chapters has a vocab list and some sentence patterns loosely based on the topic covered by the chapter. The topics range from Country names to Musical Instruments; Insects to Vegetables; Household items to Metals and Minerals etc. All sorts of topics. 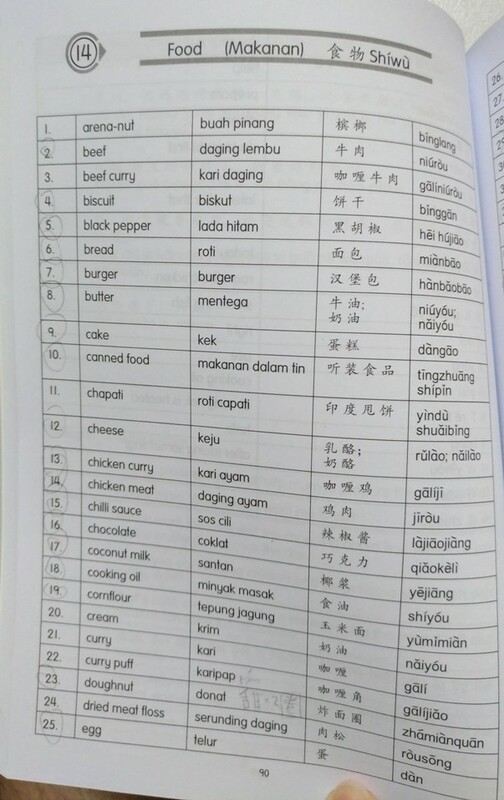 And the 4th column is a 'bonus' column of Malay words if you are interested in learning Malay while you are at it. A wise person once asked this question: "What is the hardest aspect of learning Mandarin? Is it writing? Reading? Speaking? I put it to you that listening to native speakers speak is actually the hardest aspect of learning Mandarin for a beginner." I think there is some truth to this - after you have learned the basics, perhaps the next stumbling block is understanding a native speak. Boosting one's vocab would help you to recognise what is being said in everyday conversation and I think this book does just that. Although limited dialogue and sentence patterns are offered, the examples given are quite powerful and practical in this book. Even though I've not finished this book, I can say with some confidence that the new sentence structures presented in each chapter are very relevant and can be used in normal conversation. The book comes with a CD to aid you with learning how to pronounce the words in each dialogue. The only main downside I can think of is that the book places a huge emphasis on vocabulary. I don't really see this as a problem as there are plenty of other books out there that help with conversation patterns. Another downside is, perhaps, that there is no real instruction as to how to say some of the vocab in a sentence. For example, although 耳聋 is deaf, I am told you might actually say 他的耳朵是聋的 for 'He is deaf'. There might also be a Malaysian style of Chinese going on here. When I asked Roy about one phrase in a vocab list, 溺死 (drowning), he told me that he's never come across that phrase before - he has only known it as 溺水. I don't know if some of the words here therefore are compiled based on a Malaysian understanding/slang of Chinese. Nonetheless I don't think these are major problems..
Of course nothing beats living in a Chinese-speaking country but for those of us that don't, books like these are very helpful. The patterns offered here are actually pretty good on their own, and more than enough to get any advanced beginner started. More is not necessarily better - less can sometimes be more! I'd give this book a 9-9.5/10. It's great.